Rep. Kyrsten Sinema (D-Ariz.) is running for the U.S. Senate in Arizona — a state that hasn’t sent a Democrat to the Senate since 1988. Elected in 2012 and the first open bisexual in Congress, she is running as a moderate. But she’s not one. Let’s look at her record. She became a state legislator in 2005. Around 2008, she was awarded the Vladimir I. Lenin award by the Arizona Federation of Taxpayers for being the furthest left member of the Arizona State Legislature. In 2006 and again in 2007, she sponsored a bill that would make an average Arizona citizen a felon if they were to report an illegal immigrant. She helped found the Arizona State House Progressive Caucus in 2008. In 2010, she served on the Board of Directors for the Progressive States Network. It is funded by George Soros‘ Open Society Institute. 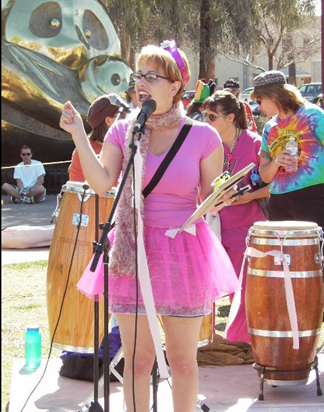 Sinema participated in and organized protest rallies against the military, against enforcing immigration laws and against Israel. 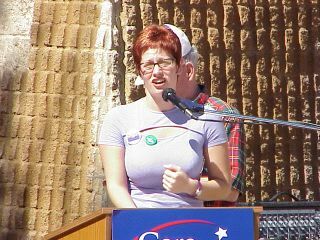 Sinema participated in and organized protest rallies against the military, against enforcing immigration laws and against Israel. In 2003, she led a far-left activist group that passed out flyers portraying American soldiers as skeletons committing “U.S. terror.” Another flyer referred to President George W. Bush as a “fascist” and “imperialist” and claimed the U.S. government was the enemy. Three times she supported legislation to create a federal “Department of Peace and Nonviolence.” She advocated for shutting down Arizona’s military bases — until she started running for Senate. She voted against a bill that would penalize sanctuary states and localities. Sinema was caught lying about being homeless as a child growing up. She told The New Y0rk Times “she spent three years as a child living in a former gas station without running water or electricity.” However, her parents were actually paying electricity, gas and phone bills at the time. Sinema has a lifetime score of only 13 out of 100 from the American Conservative Union. She has a lifetime score of only 13 out of 100 from the American Conservative Union. Her claims of moving to the center in recent years aren’t true. Her rating from the ACU has actually gone down in the past couple of years. In 2016 it was eight and in 2017 it was four. Planned Parenthood gives her a lifetime rating of 100. They awarded her their Legislative CHOICE Award. The Sierra Club designated her Most Valuable Player. She helped Obama craft Obamacare. In January 2017, she voted against a bill to repeal Obamacare. She supports background checks on private parties selling guns at gun shows. Sinema believes a license should be required to own a gun. She voted against a bill that would make concealed-carry firearm permits valid across state lines. Sinema supports the Dream Act for illegal immigrants. She’s talking tough on border security now that she’s running for Senate in a red state. But just like the late John McCain, everyone knows it’s only for show. Once she gets into office she’ll revert to her liberal positions. Unfortunately, the Republican alternative is only slightly better. Martha McSally, whose GOP establishment supporters spent nearly $1 million to defeat her conservative opponent Kelli Ward in the primary, is a liberal Republican. She says the late John McCain was her mentor. The American Conservative Union gives her a lifetime rating of 71 while in the House, worse than McCain’s 80. Republicans furious at the way her supporters treated Ward are threatening to stay at home on election day. Sinema is leading McSally by a few points in most recent polls. Sinema is charismatic, bright and a tireless worker. Unless voters know about her past record, they may not see her as much different than McSally. Follow Rachel on Twitter at Rach_IC. Send tips to [email protected]. Reprinted from The Stream.